Adam Tooby is a rising star in the field of aviation art, creating groundbreaking photo-realistic work. Moving away from traditional approaches to the subject matter, he uses computer technology to produce both technically accurate and visually dynamic images of some of the greatest military aircraft in history. Warbirds features stunning images of aircraft in action, from the First World War to the recent conflicts in Iraq and Afghanistan, and from around the world, including the iconic Spitfire, the popular P-51 Mustang and the unusual Javelin. Some of the images have been produced exclusively for the book, while others have previously featured in aviation history publications and on the covers of Airfix boxes. With step-by-step sections, close-ups showing the incredible accuracy and detail of the art – down to rivets and bolts – as well as historical context, aviation enthusiasts, military historians and artists will be blown away. Complete list of planes featured: D.III. Gladiator CR.42 Falco. Blenheim. Spitfire. Lancaster.Hurricane. Bf110. P-40. Bf109. C-47. Stirling. Sunderland. Ju-87 Stuka. Mosquito. Typhoon. Flying Fortress. B-25 Mitchell. P-51 Mustang. Fw 190. F4U Corsair. B-26 Marauder. P-38 Lightning. F-86 Sabre. Javelin. F-104. F-5. Mirage III. Lightning F2A. MiG-21. F-4 Phantom II. A-12. Su-25. MiG 29. Harrier. Tooby is a rising star in the field of aviation art. His work currently graces the new range of Airfix model boxes and he is producing covers for well known military publisher Osprey. Moving away from traditional approaches to the subject matter, he uses computer technology to produce stunning images of some of the greatest aircraft in history. This is a really beautiful book. Like a previous reviewer I had some problems with a few of the captions and the errors contained within but they in no way detract from the enjoyment of the book. A usual complaint I have about aviation art books is that there's too little art and too many words but that is not the case at all here. Marvelous, large, numerous illustrations make the book thoroughly enjoyable. My only complaint comes from the retired fighter pilot side of me and it's a complaint I have with most aviation artists... even in the midst of a swirling dogfight all of the aircraft illustrated have their flight controls dead neutral; no deflection of ailerons, rudders or elevators, even in aircraft shown generating wingtip vortices because they are pulling "G's" (hard to do with your elevator in neutral). But this is something that most folks won't even notice and it certainly didn't keep me from loving the book. I am very pleased with the quality and content of the book. It is one of the very few aviation fine art books to feature the current generation of digital aviation art. The images are large, and there are many opportunities for visual exploration of the nuances of each subject. I enjoyed the variety of complex renderings. The text is well-written, informative, and enjoyable to read. Troy pointed out the extreme detail in the art but also pointed out problems with the ordnance loadouts. ALSO, all but MAYBE one of the full color artworks have the control surfaces in the neutral position. A cursory check of photographs of aircraft in most attitudes other than level flight show observable deflections of the control surfaces. This may not be significant to most people, but these control surface deflections give that extra bit of realism of flight that other aviation artists typically include. 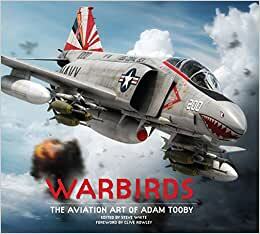 Great computer-rendered drawings by Adam Tooby on my favorite subject, combat aircraft. He is a master of this type of artwork and the renditions are so nicely detailed that really bring the subject to life. It sits now on my living room and every visitor comments on it. Thoroughly recommended.